A pronoun replaces a noun in order to avoid repetition. Subject pronouns function as the subject of a verb. Unlike English, the use of subject pronouns is optional in Spanish. Many dialects of Spanish only use subject pronouns for emphasis or in cases where it is not clear who the subject is. Notice in the example below how the English translation makes use of 5 subject pronouns, while Spanish only uses 1. Entonces se bajó, y agarró su hacha o su pico que traía, creo que era un pico, y tumbó la puerta como pudo y allí estaba yo tirado en el suelo muy, muy mal, morado desde el cuello hasta los pies. So he bent down and grabbed his hatchet or his pickaxe that he brought, I think it was a pickaxe, and he broke down the door the best he could and I was there sprawled on the floor very very sick, purple from my neck down to my feet. Subject pronouns are labelled by the term person, referring to the subject’s role in the conversation. 1st person refers to the person(s) speaking (I, we); 2nd person to the person(s) spoken to (you); and 3rd person to the person(s) or thing(s) spoken about (he, she, it, they). There are two other subject pronouns that aren’t often mentioned in introductory Spanish courses: vos and vosotros. Vos is used in Argentina for the informal second person singular (you) instead of tú. 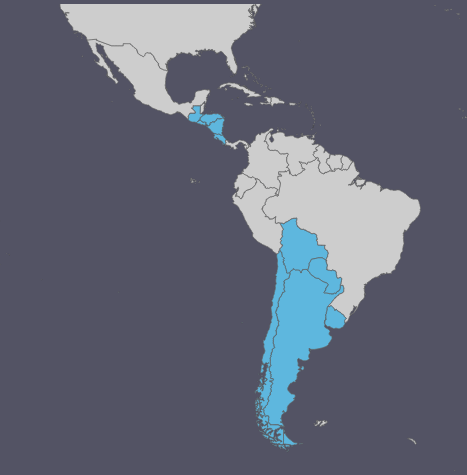 In several other countries, vos is also used along with tú: in Central America (El Salvador, Guatemala, Honduras, Nicaragua, Costa Rica) and the Southern Cone (Paraguay, Bolivia, Chile and Uruguay) So rather than replacing tú these countries often make use of vos, tú and Usted to mark different degrees of formality when talking to someone. Cuando va mi papá allá, lo primero que le dice – mi hijo está interesado en vos – sin ningún cuidado. When my dad goes over there, the first thing he says to her is “my son is interested in you“, without a care. Vostros is used only in Spain and Equatorial Guinea. 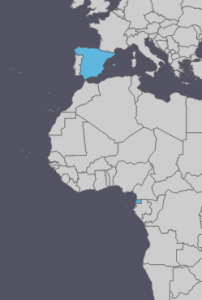 In these countries, vosotros is used for informal second person plural (like you guys in English) and Ustedes is used for the formal plural you. In the rest of the Spanish-speaking world Ustedes is used for both formal and informal. Unlike the English pronoun I, yo is not capitalized unless it begins a sentence. The pronoun tú is singular and, importantly, informal. Use tú to address people your own age and those you know well. Ellos and ellas agree with the gender of the noun they replace. Ellas is used to mean they if it replaces people who are all women. On the other hand, ellos is used for a group of all men or any group where there is at least one male person in the group. The pronoun ustedes is always plural. Despite of its meaning (you/y’all), grammatically it is a third person pronoun, meaning that it will always be used with third person verbs: Ustedes son.